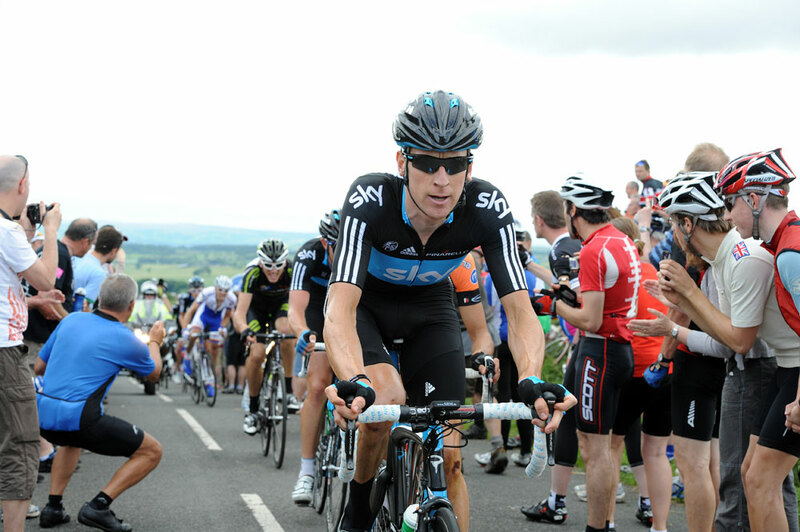 Bradley Wiggins (Sky) took a solo win in the men’s British Road Race National Championship in Stamfordham, Northumberland, on Sunday. Just as last year, Sky set the pace of the race and brought home a 1-2-3, with defending champion Geraint Thomas and Peter Kennaugh claiming second and third respectively. A 12-man group comprising Bradley Wiggins, Ian Stannard, Alex Dowsett, Chris Froome, Geraint Thomas, Peter Kennaugh (all Sky), Ian Bibby (Motorpoint), Kristian House (Rapha Condor Sharp), Daniel Fleeman (Raleigh), Steve Lampier (Sigma Sport), Ian Wilkinson and Rob Partridge (Endura) distanced itself from the main bunch early in the race. By the second of three long laps taking in the Ryals climb, the 12 had built up a lead of well over four minutes on the chasers. 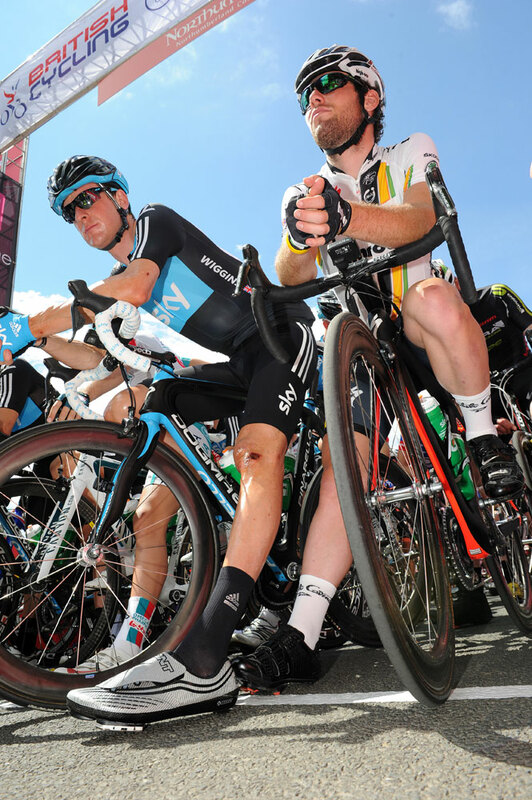 Wiggins, Thomas and Kennaugh had broken out of the lead group by the first of the four shorter finishing circuits to the north-west of Newcastle. 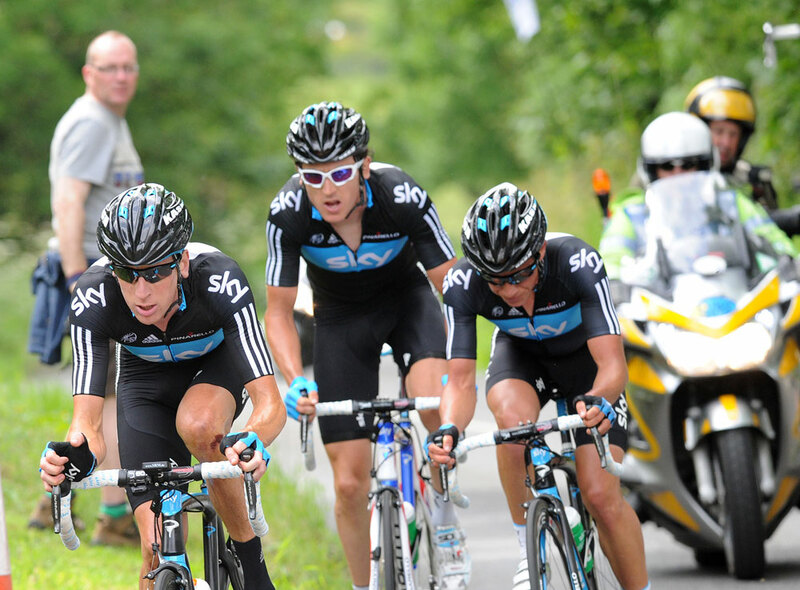 Stannard, House and Bibby chased hard but could not re-gain contact with the Sky trio. 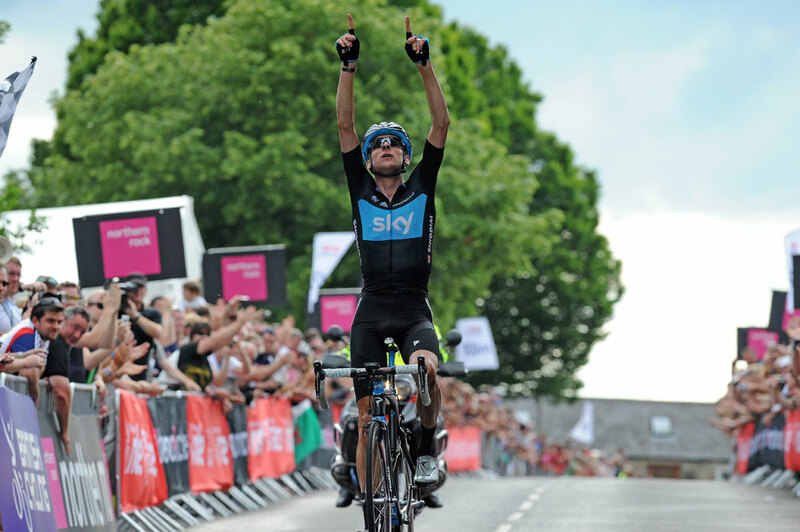 On the final finishing circuit, Wiggins attacked his two companions to take a solo win with Thomas out-sprinting Kennaugh for second place both at 35 seconds. Stannard finished fourth at five minutes and 41 seconds. Scott Thwaites (Endura) finished ninth to take the under-23 men’s title. It’s Kennaugh’s fourth consecutive podium placing at the National Champs – a fact made all the more remarkable given that he withdrew from the race earlier in the week due to a cold, only to make a last-minute decision to take part. Wiggins will now wear the British Road Race National Champion’s jersey in the Tour de France, starting on Saturday (July 2), in addition to his British Time Trial National Champion’s jersey. Mark Cavendish (HTC-Highroad) was mobbed by fans before the start of the well-attended race, but his chances of taking the national title were dashed after suffering a double puncture. The Manxman subsequently withdrew from the race along with Roger Hammond (Garmin-Cervelo), Jeremy Hunt (Sky), Chris Froome (Sky) and Daniel Lloyd (Garmin-Cervelo). Earlier in the day, Lizzie Armitstead (Garmin-Cervelo) won the women’s race with Laura Trott (Moving Ladies) taking the under-23 women’s title. Everyone wants to win this race, and (head coach) Shane Sutton told me that he wanted me to empty it today, win or lose. Even this morning in the meeting there was no designated leader, it was just a case that Team Sky have to win. We rode as a team and packed them up there in numbers. It wasn’t until the latter stages when there was three of us that you realise it’s going to be one of you. I bided my time and although it was a flat finishing circuit, it was quite tough round the back because of the headwind. I picked my spot two or three laps out and I thought ‘it’s all or nothing’, because I knew I wouldn’t beat G (Thomas) in a sprint. I’m the fortunate one who managed to win it. You’ve still got to get up there and get to the front. It was a tough day today – we were hitting each other hard all day, especially up the climb – and it hasn’t really hit home yet. The team knew what we had to do today. We attacked from the start and we were all on the same page. I feel a bit bad for the other teams as having six guys out of 12 in that front group just makes their afternoon difficult. But that’s the way it is, and we were never going to be kind to them. I attacked the race, as I think that’s the way to ride the nationals, and I felt pretty good. I made all the right decisions until the end. I was a bit surprised when Brad went, and I thought I’d gamble to see if Pete would try and close it. I just wish we’d gone up that climb a few more times as my legs felt really good. Once you were on to those finshing circuits there wasn’t a lot you could do. I’d tried to go with around 10km to go. I tried just to test the water and Brad just went over the top, and obviously once Brad gets a gap like that it’s impossible to close down. I don’t think I have [got the distance in my legs] to be honest. My legs went coming off that big circuit. I was alright on that hill but over the top I was alright but over the top my legs were just giving in. A break went straightaway; me and Peter Kennaugh were going across to it. There was about 45 seconds between the break and the peloton and we got to 15 seconds behind the front group. We were closing in on it and the service car was behind the break and I punctured. In a European race with two guys coming across service would drop behind them, but we’re not in Europe, so I had to wait 45 seconds until the peloton arrived, for the whole peloton to go past and then for the car to get a new wheel. By the time I got back, they’d already gone. It’s always a huge feat to take the fight to Sky. They’ve got so many riders, and so many good riders they can do what they like out there. I think it was a pretty safe bet that the winner would come from them. In previous nationals being the favourite was a kiss of death, but not anymore. Ian (Bibby) did all we could ask for really.